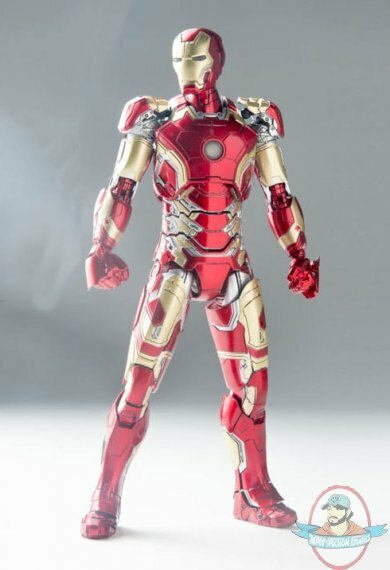 From the movie "Avengers: Age of Ultron" comes Iron Man's armor, the MK XLIII, in an extremely detailed die-cast action figure from Comicave Studios. Feature light up chest and eyes via LED and contains 75% diecast embedded throughout its body for weight and stability. Armor features metallic finish in vibrant red and gold coloring with forearm and shoulder mounted weapons and panels that open in lower legs. Includes interchangeable hand parts.